The newly-sealed road along the Madang-Lae Highway is already seeing several major damages. PMIZ Phase 1 funded under a US$95 million soft loan from the China Export Import Bank. I decided to publish some information about PMIZ where I previously worked from 2006 to 2011. If you see the picture above, the existing portion of the PMIZ is on the far left hand side of picture with the square field. The rest is forecasted in Phase 1. The Pacific Marine Industrial Zone (PMIZ) is expected to kick of its detailed engineering design phase in April of this year once the design concept is approved and endorsed by National Fisheries Authority and Department of Commerce and Industry as lead agencies of the Government of Papua New Guinea. The Detailed Engineering Design will be undertaken by China Shenyang International Economic Cooperation who has been engaged as the General Contractor under a Project Agreement with the Independent State of Papua New Guinea. The first phase of development of the PMIZ will be funded under a US$95 million soft loan from the China Export Import Bank. Phase 2 will cost US$66 million. The total project cost is US$161 million. The Government of PNG is required to put up 20% as equity. GoPNG is required to up K11.6 million as counterpart fund before the loan for Phase 1 can be released. Detailed Design will take up to 6 months and construction will take 3 years to complete Phase1 of PMIZ. Posted on March 10, 2016 May 15, 2016 Categories Maritime AffairsTags Fisheries, GoPNG, Madang, Pacific Marine Industrial Zone, PMIZ, RD Fishing, Shenyang International Economic Cooperation, Vidar2 Comments on PMIZ Phase 1 funded under a US$95 million soft loan from the China Export Import Bank. Affordable Rent Houses at Ulifun Island. There are affordable rent houses at Ulifun Island in Madang. Rent range from K50 to K400 a fortnight depending on the condition of the house or type of accommodation. There are semi-permanent houses and village style houses. The semi-permanent houses are constructed with timber and roofing iron and the walling constructed from the rachis of a Sago palm. Some are constructed with timber and a thatched roof weaved with sago palm leaves. Village houses are made the traditional way from bush logs and Sago palms. Some Village houses may have bamboo strip flooring or wooden planks while there are also a few houses built on the ground with a dirt floor. The kitchen and toilet facilities are separated from the main house. Most toilets are located along the shore line and build in a manner that an opening in the floor is positioned over the water so when the sea rolls in it dilutes and breaks down any waste matter which then becomes part of the seabed. There is a constant supply of fresh water collected from wells and it is hauled up with a bucket attached to a rope. A jetty at Ulifun Island where passengers can board the ferry boats. Ulifun Island has ferry services to the mainland and urban area. It costs K1 to get to town. There are three banana boats (dinghy) operators who reside on Ulifun Island providing the ferry services. Anton, Francis and Maus Grass provide the ferry services to people of Ulifun and neighbouring islands. Some people also living on the mainland along the coast rely on the ferry service as a more convenient means of getting to town. The picture above shows a make shift jetty at Ulifun Island made from five coconut logs strapped together. It is very helpful for the woman who load their goods to market at the Nelrik boat stop in town. There is no Electricity supply on Ulifun Island and most people on the island use battery powered lanterns and torches when it gets dark. Others rely on solar power as a source of electricity for lights and for charging their mobile phones while some use electric generators that run on fuel. Otherwise you can always make an open fire and sit under the stars and watch the moon rise. It’s a quiet and simple way of life at Ulifun Island but a house is only a house if there are no people in it and it’s the people living in the houses and the way of life that makes Ulifun Island truly, a unique and wonderful place to live. Posted on March 10, 2016 September 25, 2016 Categories Momase, Walks of lifeTags Accomodations in Madang, Biodigradable, Island homes, Madang, Madang Islands, Madang Town, maritime province, Nelrik, Offgrid house, Offgrid Living, Rent House, Rural Living, Rural Rent, Solar Power, Ulifun IslandLeave a comment on Affordable Rent Houses at Ulifun Island. 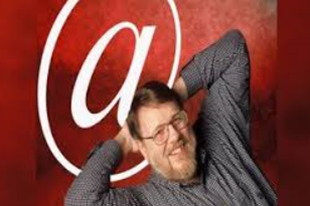 Many of us take emails for granted these days but the invention of the email including the ground-breaking use of the @ symbol in email addresses, which is now standard was created by Mr. Ray Tomlinson who died of an apparent heart attack on the Saturday 05/03/16 at the age of 71. It was 1am in the morning and we had finally arrived in Lae Morobe Province after traveling 11 hours from Madang Province across the rugged Madang Ramu Highway on a Toyota 15 seater PMV named “Tear Drops”. I had seen better days when we clocked 4 hours. This trip had taken almost 11 hours. The Madang Ramu Highway had deteriorated into a bush track. Anyway, I was on my return trip back to the Mine Site where I worked and came to Lae, Morobe Province which is my point of hire and to catch a Plane back to Porgera. You can just imagine seated in a fully loaded 15 seater Public Motor Vehicle with stinky passengers and a loud drunkard preaching non-stop over the mobile phone to his folks back home. He was a big, white bearded person with a pot belly and a deep voice. I was feeling tired, fatigued and all I wanted to do right then was to stop over and stretch out. After dropping off some passengers around the safe zones in Lae City; to my surprise, the drunkard School Principal suddenly started bossing the driver of the bus to visit places around Lae city so that he could catch up with his friends with the possibility of getting more grog. One of those places was way outside the safe zone especially at 1 am in the morning. The driver obediently followed instructions because he had been bribed a share of the beer plus he had drank 7 cans of beer along the way. There were four of us remaining on the bus apart from the drunk man . We agreed to sleep it out in the bus for safety sake until day break and then transit. However, to our amazement, we headed right into Nawae Block and onto a bush road with shrubs and tall grass ushering us into the dark. Nawae Block is a settlement known for breeding notorious criminals. Recently there were ethnic fights in the area and we had only learned of the 62 inmates breaking out of Jail at Buimo Correctional Services earlier during the day. If those inmates needed a place to hide, this was a good place and what a better opportunity then a bus that they could get away in. Thoughts of being robbed at gun point and being slaughtered in the bushes started to creep in. I was not afraid, maybe it was the fatigue. I was preparing for a fight and if something did happen, the first person I was going to hit was that loud mouth school teacher. It’s been awhile since I posted. I guess facebook took up most of my time up until now. Today marks a new era after 6 years since my last post. A lot has changed since then. I left my previous employment with RD Fishing PNG Ltd. and went to work for Barrick Porgera Mine up in the highlands of Papua New Guinea in Enga Province. I suppose the new job, the new environment and adjusting to a new life of Fly in Fly out (FIFO) roster was more of a reason why I neglected the blog. Being away from the family in Madang and Lae was the part I hated most about the job but I guess I got used to it. My work colleagues became my family for three weeks on site at Porgera until I flew out on field break to Lae. Once in Lae Morobe Province, I jumped on a highway PMV to travel to Madang Province via the deteriorating Madang Ramu highway. It takes about 6 hours on average to get from Lae to Madang but the road conditions make the trip longer; about 10 to 11 hours. There are countless tales encountered along the way and I will keep you posted. The last trip was crazy. I will tell you all about it in my next post.